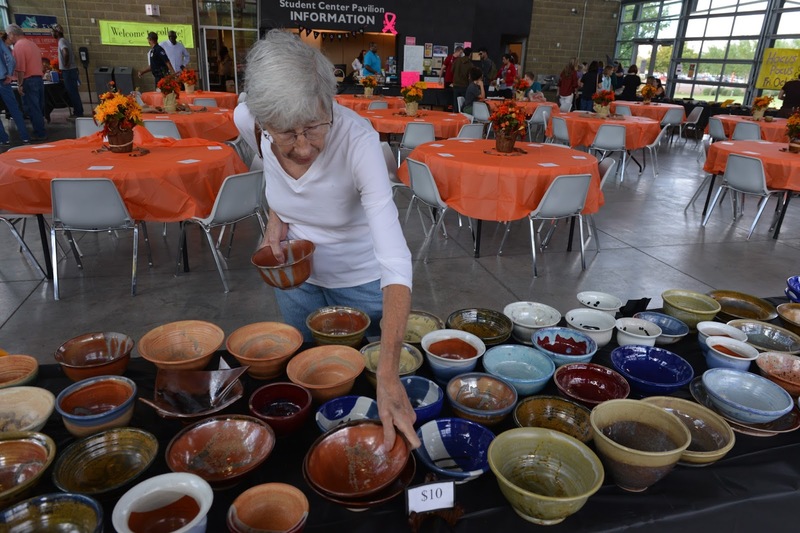 Chandler-Gilbert Community College (CGCC) raised over $5,500 for the Chandler Christian Community Center (CCCC) to assist families in need of food at the 3rd Annual Empty Bowls event on Tuesday, October 20. The event was sponsored by members of Student Life and the Service Learning Office. Attendees purchased handmade ceramic bowls for $10 made by the CGCC ceramic students with 100 percent of the proceeds benefiting CCCC. "We are extremely grateful for those who came out to support the Empty Bowls fundraiser and to help fight hunger in the local community," said Alexandra Cannell, Service Leaning Coordinator at CGCC. "The goal of Empty Bowls is to bring food to the table for families in need by bringing art to the community. Due to the dedication and participation from our students, we were able to achieve that goal." Event attendees were served a 300-calorie meal which included a cup of hot soup and a bread roll donated by Dilly's Deli, Liberty Market and Whole Foods. This small portion meal was meant to signify the average amount of calories a food-insecure person eats in one day. Empty Bowls at CGCC is part of a district wide fundraiser that raises funds for families in support of World Food Day (October 16), a day of action for people around the world to come together to declare their commitment to eradicate hunger. CCCC's mission and vision is to change lives by nourishing minds and bodies to create a connected thriving community and to have a healthy and productive community built on a foundation of dignity and hope. Each year CCCC distributes over 15,000 food boxes locally with enough food to feed 50,000 adults and children. For more information about CCCC visit www.chandlerfoodbank.org.